THE IRISH WHALE and Dolphin Group has reported a further seven whale strandings after an initial three were reported earlier this week. Yesterday, the IWDG reported that three Curvier’s beaked whales had been found dead in separate locations in Mayo and Donegal, describing the strandings as a cause for concern. The group has since received seven more such reports – two in Galway at Inishturk and Omey Island, one in Sligo at Cliffony and three in Donegal in Falcarragh, Inishboffin and Inishowen. Another carcass, also believed to be a beaked whale, was spotted from the Celtic Explorer vessel. Mick O’Connell, coordinator of the IWDG Cetacean Stranding Scheme said that he believed the actual death toll is likely to be much higher, describing the whales that have been spotted so far as the “absolute minimum”. O’Connell said that beaked whales are particularly affected by loud underwater man-made noise such as naval sonar. He said that there would be no post-mortems carried out on the whales because they were in such a poor condition when they were found. “If one was carried out, a post-mortem would show acoustic damage in the whales inner ear and bubbles in their organs, if sonar did play a role in their deaths. “The bubbles would be caused by decompression sickness, which is odd because whales are designed for dealing with pressure changes. O’Connell said man-made causes like sonar were likely to blame. A spokesperson for the Defence Forces said that the Irish Naval service does not use sonar on its vessels during any of its activities. Britain’s Royal Navy regularly carry out training operations using sonar. Asked about the strandings the Navy said in a statement that there is “no evidence that the deaths of these marine mammals have been attributed to any Royal Navy sonar operations, trials or exercises”. “We take our environmental responsibilities very seriously and continue to work with the relevant UK authorities to reduce any environmental risk. A necessary series of safety checks is observed and an environmental risk assessment is carried out before any underwater task is undertaken by the Ministry Of Defence, to minimise any potential risk to marine life. 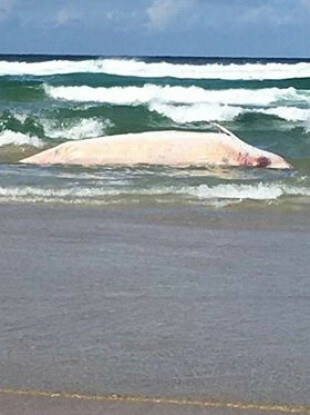 Email “Concern sonar may be causing strandings as seven more whale deaths reported ”. Feedback on “Concern sonar may be causing strandings as seven more whale deaths reported ”.